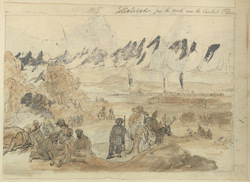 Drawing executed in pen-and-ink and water-colour of Jalalabad in Afghanistan with people in the foreground by James Atkinson (1780-1852) dated 1840. Inscribed on the front is: 'Jellalabad from the north near the Caubul River'. This is folio 7 verso from an album of 17 drawings of views in Afghanistan from the Kyber Pass to Kabul by Atkinson. During the First Anglo-Afghan War (1839-42) Atkinson served as Superintending Surgeon to the Army of the Indus, a combined force of British and Indian troops. A talented amateur artist, he took the opportunity to complete many sketches en route in which he portrayed the mountain passes, rocky gorges and arid plains so characteristic of the country. Jalalabad is situated in eastern Afghanistan near the Khyber Pass. The modern city was built in the 1560s by Emperor Akbar, grandson of Babur, the founder of the Mughal Empire. It stands in an important strategic position dominating the entrance to the Laghman and Konar (Kunar) valleys and is a leading trading centre with India and Pakistan. During the Anglo-Afghan Wars, Jalalabad was occupied by British forces. The town’s defences were destroyed at the end of the First Afghan War but were rebuilt in 1878 when the town was fortified by a surrounding high wall with bastions and loop holes.